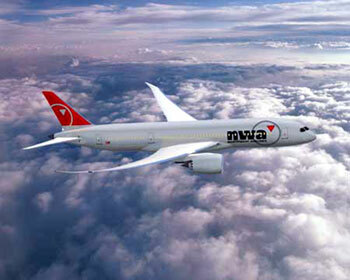 Northwest Airlines is a United States based airline carrier. The airline headquarters is located at Eagan, Minnesota which is neaby Minneapolis-St. Paul International Airport. Northwest Airlines is considered to one of the largest airlines in the world when comes to passenger miles flown (ranked 4th). Besides having one of the largest domestic route networks in operation throughout the U.S., NWA also handles much more passengers across the Pacific Ocean compared to other U.S. carrier and also handles more domestic air cargo than other U.S. based airline. Perhaps the largest cargo carrier in U.S. as of 2006 is NWA Cargo. Its cargo fleet consists of more than a dozen Boeing 747 freighter aircraft and operates flight services to/from main cities throughout the United States and Asia. NWA Cargo link up with its hub in Anchorage, Alaska (Ted Stevens Anchorage International Airport) which results in a quick and efficient transfer of cargo between major cities located on either sides of the Pacific. Besides freight cargo transportation, NWA Cargo also handles freight services aboard the passenger fleet of Northwest Airlines. This service covers up to more than 250 cities around the world.